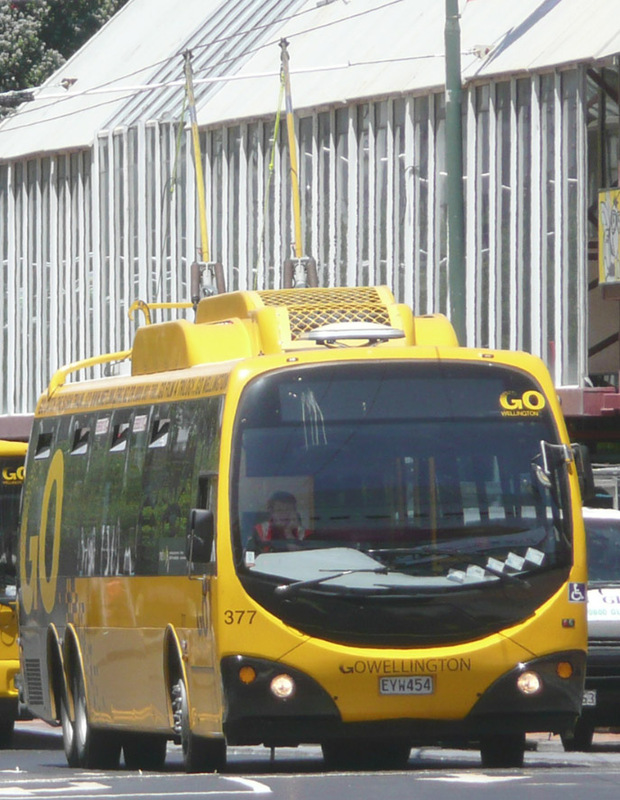 There’s a sort of grim inevitability in the news today that GWRC plans to kill off the trolley buses in Wellington. 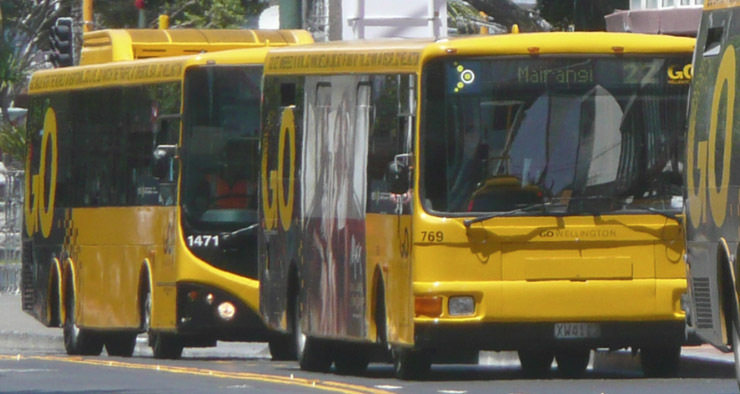 Following on from the tedious decision that the answer to Wellington’s Public Transport spine is bigger, faster buses in their own dedicated lanes, the logical thing to do would be to find out what sort of vehicles they would be, before making the decision to axe one of the options. But trolley buses have never been given a level playing field to operate on. Chronically underfunded for years, Wellington Cable, who own the lines, has only been given tiny 3 year contracts for years, negating the chance for any meaningful long-term investment. Greater Wellington Council have been planning this execution for years. None the less, a round of “consultation” is beginning this week, to ask us Wellingtonians what we think of this, although the decision has already been made. Personally, I’m inclined to just tell them to bugger off and leave our trolley buses alone. With the exception of an few who prefer diesel to electric, most home grown Wellingtonians seem to prefer the use of trolley buses. There’s something about the completeness of the system – we live in a windy city, we have the world’s most efficient wind farm on our doorstep, we use that wind to create our electricity, and we use that electricity to enable our buses to go. Plus, they’re quiet, efficient, smooth, and slow enough to be comfortable. I moved to Wellington, out of a preference for a city that still had time for a trolley bus and working train system, rather than go to Auckland with its hideous reliance on motorways and cars and diesel trains and diesel buses. I will be immensely sad to see the end of the trolley buses. The diesel engine is a wonderful invention, lauded by Robbie Coltrane in a TV series a decade ago, where he noted its ability to keep going forever, utilize second-hand cooking oil as fuel, and combine maximum torque-ness with the ability to scale up to massive size. There is no equal for a diesel Cummins or Caterpillar when it comes to trucks, diggers, front end loaders or gigantic earth movers. It is, however, a poor choice for domestic buses, especially if you are cycling along side one in a busy bus-lane. If not perfectly tuned, clouds of sooty black particulate spew out of the back end. Diesel dust that is proven to have some pretty nasty health effects on those who live near and breath in the fumes. There are some other options for bus propulsion, of course. There is the potential use of CNG or LPG, both of which New Zealand has been using and testing for a number of years, and while CNG is produced here, and is cleaner burning, smells sweeter, and causes less damage to the environment, for reasons that I never quite understand, New Zealand has all but abandoned it as a fuel, in favour of LPG which we have to import. There’s probably a gas turbine option as well, which I know keeps getting discussed, but I’m really not cognizant of the advantages or disadvantages of that as a reliable transport system. And then there is battery power. Every small thing has a battery now. Watches have a battery. Phones have a battery. Cameras have a battery. Even solar cells need to have a battery. And of course, every car and bus has a battery. Battery technology has come a long way since the invention of the lead acid battery, except for car owners. Every single car on the road in New Zealand still has a lead acid battery. I don’t think I have seen an electric Tesla on the road in New Zealand yet, although they would be the exception. Elon Musk’s use of lithium-ion batteries in the Tesla has been one of the revolutionary things about the last 10 years, and just recently he announced a new battery plant at Tesla that would massively ramp up production of this room of battery. But even though the councils have announced that trolley bus wires will be coming down, on the assumption that buses may still be able to be battery powered, there is not much in the way of reliable battery power for buses. A BRT large fast high capacity modern bus is still a huge amount of weight to push around, and I’m not seeing reliable reports of bus battery systems that can work day in, day out, up and down hills, and recharge in an instant – at least, not as reliably as a connected electrical supply, or a diesel engine. And lastly, I’ve got to say, there is the option of electric overhead cabling. No, not a trolley bus wire, which requires two cables, and long poles to connect, but just the single wire system that we have on our electric powered trains, connected to by a pantograph. Hugely more flexible and easier to use than a trolley bus wire, and if the money is put into the maintenance of the system, I see no reason why it should not be able to work. Key thing is, we need to have a system that is reliable and will last the distance, even given the uncertainty of what our city will look like in 50 or a 100 years. My money would be on electricity, rather than oil. I was in Shanghai recently and they have moved to a wireless, supercapacitor system of electric buses (see http://www.tbus.org.uk/wireless.htm). They have the cleaner advantages of the electric engine without the ugly overhead wires, simply recharging at small stations around the city or at the depot. Having seen someone killed by a trolley pole coming free on Lambton Quay, I am no fan of them. There are places in town where the overhead systems are huge challenges for the drivers to keep the poles on (the roundabout by the Miramar cutting is a classic for them. This is the best Wellington news I’ve heard for a long time. We’re finally going to get rid of the ugly tangle of wires that stops us having an uncluttered view of our buildings and the sky. Maybe they could finance the wire removal by letting people cut one of the wires for a $10 donation? If so, sign me up for half a dozen and I’ll bring my own bolt cutters. As a transport option, the trolley buses were erratic with the poles coming off on a frequent basis. They couldn’t pass each other. They don’t seem to have much power which means they crawl up hills, which is something we have a lot of in Wellington. They’re really expensive – you say they’ve been underfunded, but the last upgrade of the wire infrastructure was only a few years ago and amounted to half a million bucks per bus. And they’d need similar expenditure soon if we kept them around. Lastly, they’re pretty marginal in the scheme of things since only a tiny minority of buses are trolley versions. The only reason that we still have trolley buses is that some people get all gooey and nostalgic about the “good old days” in the 1950s or whatever era they pine after. But it is 2014 and people expect their infrastructure to work efficiently. I reckon Go have had in for the trolleys buses since they took over. I get the impression they don’t have specialist drivers for trolleys anymore? Some drivers will stop and flick switches for 5 minutes seemingly not knowing what they’re doing. They take the poles down, flick some more switches, then put the poles back up again. They drop the poles going around the tighter corners, try and overtake other trolleys (seriously) and struggle with hill starts. They mostly seem to shift the trolleys around ‘Not in Service’ in the evenings. Why just the trolleys and not the diesels? Lastly they seem to be able to overtake each other just fine when the one behind is running ‘Not in service’ heading back home to Kilbirnie. The driver in the bus behind will yank down the poles of the bus in front as they both pull into a bus stop. The front driver (with a bus load of people) will then leap out and re-attach the poles whilst the ‘Not in service’ bus whizzes past. Nice – so the driver of the ‘Not in service’ bus can get home earlier and stuff the bus load of paying customers! On the old ‘let’s get rid of the ugly wires’. There are still going to be lot of other wires up there – power, telecom, telstaclear (now Vodafone), Citylink fibre etc. So I can’t see why they can’t keep trolleys on the new north-south/east-west routes? Seems like that would counter most of their arguments? Run the trolleys to these hubs.. over well used routes. Yes. I was rejoicing when I heard the news. It is a pity we have to wait until 2017, but I suppose they need time to procure replacement buses. In general Celia Wade-Brown has been a do nothing mayor. Her light rail idea was never going to happen, and she hasn’t constructed even a meter worth of bike path. On the other hand, the attempts to build a high speed bus route through the city has made for a worse pedestrian experience. Not Manners Mall, which was a pretty grim area at the best of time. But the replacement of pedestrian crossings with lights, and the barriers that were erected in Willis St for months. The mayor seems to be a bit bewildered at times, not knowing that the council was outsourcing jobs or what the price of decorating her temporary office was going to be. But all that was forgiven when she announced the end of trolley buses. Each to their own David, each to their own. I’m not really sure if your comments on Celia Wade-Brown are just an attempt to be provocative, or if you really believe what you are saying, but some of them are obviously quite wrong, while others, sadly, are right. I don’t really want to get into a political debate on the relative worth of our Mayors, but has Wade-Brown really achieved less than Prendergast, or Blumsky? Admittedly, all of them pale into the background when it comes to comparison with Len Brown, who does seem to have a passion, not only for small Asian women, but also for underground trains to solve the city’s traffic woes. Which, I dearly wish that one of our mayors here would have the guts and verve to stick up for. Tom – interesting comment – I had no idea that sort of horse-trading activity on the trolleys went on in the suburbs. They don’t do it where I live, that’s for sure. But then, I like trolleys. I like them to the extent that when a bus comes along with a diesel engine, I’ll stand aside and let it pass by, and wait for a trolley. Smooth, quiet, elegant. Just like me. Such as? The only thing I said that might not be irrefutably true is if the council has built some bike lane and I haven’t noticed. If that is the case, then I apologise… but I’ll also need to compare what was delivered against what was promised, which included a bike lane around the harbour to Eastbourne. Len Brown has taken the title of NZ’s Most Hopeless Mayor from Andrew Williams. I don’t understand why Auckland saddles themselves with these losers. While I don’t think Wade-Brown has achieved much apart from scrapping the trolley buses, she seems to be a nice person and her personal integrity has never been questioned by anyone. Whereas Brown is a corrupt creeper. I’d agree with you that Andrew Williams is a loser – his most well-known act so far in his political life is his urination on some lemon trees in public, somewhere on the North Shore, and for that we should be most welcome, because certainly the rest of his public life is just a load of old piss. Hmmm. But Len Brown – shagging aside, and propensity for public singing aside, and propensity for a mild level of corruption in the form of taking free hotel rooms to cover up his wild late night shagging aside: he is the first Mayor that Auckland has had since Dove Myer Robinson, who may actually give Auckland a chance to get up and get moving. The push for the CTL is vitally important for Auckland to survive and prosper, and needs to be forced through, at the end of a gun-barrel if necessary – Auckland is doomed if its future remains cars. They need to get their public transport flowing, and so far, Brown seems to be the only person pushing hard for that. I’m not sure why you think he is useless – Hubbard was useless, Banks was just a total turd, and useless to boot, and Fletcher was, it seems, completely hated by everyone. Who would you rather Auckland had? Palino? Banks again? Fletcher again? Or perhaps some two-bit has been actor from Shortland Street, which probably everyone from Auckland would vote for as they would be a familiar face. Don’t laugh: remember Ronald Reagan. I thought Tawa was a suburb of Porirua, but Wikipedia says it is actually a part of the city. So I’ve learned something today. Maybe we need a sign on the motorway to tell people when they leave Wellington, just in case they accidentally stray in to Porirua? Brown’s corruption wasn’t limited to freebie hotel rooms. I don’t recall the details, but he was fiddling his expenses when he was mayor of Manukau. I don’t know what the alternatives are, but surely if competent candidates aren’t standing for council then you already have a problem? How do you feel about politicians like, say, Silvio Berlusconi? I’d say he was a seedy corrupt man who made a joke of Italy. But I suppose if you ignored the corruption and the creep factor, then he was as competent as Brown and probably made the trains run on time. Ha ! Absolutely – Berlusconi was / is / forever will be a seedy corrupt man. But, to give him his due, at least he did introduce the phrase “bunga-bunga” to the world…. My own (private) feeling on why we have such terrible candidates standing as politicians? Because, once upon a time, being a local politician meant you were someone, someone important maybe, respected, lauded, and not infrequently, bribed. Hence, people who’s egos needed stroking, ie politicians, stood for the job. Nowadays – you get vilified by the public if you make out you’re a big shot. They hung Mussolini, and Nicolae Ceaușescu, and others who thought they were big shots. Now we have small shots. Wade Brown for instance, as you say, seems impeccably uncorruptable, but perhaps doesn’t have the animal instinct to go for the jugular and throttle the life out of her opposition. Others, typically males, like John Morrison, see this as a weakness. Others may see this as a good thing. But can we get back to the trams and trolleys? Replacing the trolleys? Well there are only about 60 of them and the rest (say 400 I think) are standard old diesels. If the money was used to switch ALL the buses to modern electric maybe it wouldn’t be such a bad thing. Then everyone would benefit, not just those lucky enough to live where the wires run. Check out the TOSA bus in Geneva which uses quick 15 second charges at main bus stops. http://youtu.be/c-Fg94A2Vko There seems to be a lot happening overseas in this area. Thanks LX, interesting and useful clip. I’m a bit suspicious of anyone claiming 15 second recharging, as I really don’t know how anyone can make that work – at least, it goes against everything I learnt about batteries at high school – but it’s clear that if ABB are saying it works, then it does. There will be other issues in Wellington, given our hills, and greater drain on batteries. I must be a bit strange as I don’t share the hate for the trolley wires, I kind of like them. It would definitely take some getting used to them not being there. The GWRC seems to really have a hard on for ruining Wellington with its stances on transport in recent years. I read the link after I posted it and realised it was a bit of a sales pitch on trolley buses!… I only managed to ask one person about the super cap buses and they said they were great… hardly research, I admit but I suspect the trolley bus sales pitch was unbiased also. OPINION: As far as the future of Wellington’s trolley bus system goes, please don’t make the mistake of abandoning the system for the sake of some short-term financial issues. The Wellington City Council’s consultants’ report says that “international trolley bus use has reduced in recent decades”. This is simply wrong. There are about 40,000 trolleys around the world; as it happens there are about the same number of trams. A lot of money is going into developing and expanding existing systems and into new systems, even in Saudi Arabia. Leeds in England is planning a new trolley bus system. Leeds has done its homework, studied modern European trolley bus systems and concluded that modern trolleys are the cleanest, greenest and most economic way to run its planned zero emission Bus Rapid Transit System. Wellington’s trolley buses are the cleanest and greenest way of operating an urban public transport system that, practically speaking, you can have. They are completely zero emission. Their electricity supply is already more than 70 per cent renewably generated. Although Wellington’s existing trolley buses should be good for a few years yet, what, apart from new trolleybuses, could you replace them with? How about European style Euro 3, 4, 5 or 6 diesel buses? Whatever you may have heard about ever tighter regulations on diesel emissions in Europe, be aware that modern European diesels are in practice no cleaner than older versions. London Mayor Boris Johnson has effectively said so in an article in the British Daily Telegraph (April 7) and he should know – London has been trying to clean up its 7000 strong diesel bus fleet for years, but London’s air does not get better. London is now looking towards zero emission vehicles. What about diesel-electric hybrid buses? These are diesel buses (with Euro 3, 4, 5 or 6 engines) with electric regenerative transmissions that may save a little fuel compared with ordinary diesels, but not enough to justify their much higher purchase prices and battery replacement costs. Fuel cell buses? A trial fleet of 10 is about to go into service in Aberdeen, Scotland, at a cost with re-fuelling facilities of [PndStlg]19 million (NZ$37m) – not at those prices. Battery electric buses? The current state-of-the-art buses, with full-sized batteries, are well represented by a trial fleet in London. The battery buses are about 40 per cent heavier than equivalent diesels and carry about a third fewer passengers. They can carry enough charge to do one shift a day, but not the two shifts that diesels or trolleys are generally expected to do. You would need about three battery buses running at any one time to carry the same number of passengers two trolleys or diesels could, plus an extra driver. Over two shifts in a working day, six battery buses would be needed to cover what a couple of trolleys or diesels can cover in two shifts. So that’s three times as many battery buses and a depot three times the size. And those three battery buses running to carry what two trolleys can carry will use about double the amount of electricity, because of their extra weight. Thinking about charging battery buses in service? Then you will have to extend layover and/or running times to make that possible at increased cost. Thinking about charging battery buses on the move? The most cost- effective way to do this is from a pair of overhead wires. The current state of the technology of traction batteries is not yet fit, and may never be fit, to allow battery buses to replace trolleys or diesels, other than on easy-duty cycles. However, the technology is suitable to provide trolley buses with a very useful off-wire capability. So, buy new trolleys with state of the art traction batteries to replace your existing trolleys. Over time, savings in energy and maintenance costs of these vehicles will generate the funding to renew the fixed infrastructure. And surely, you don’t need to renew your infrastructure all at once. Phase the expenditure over time. Irvine Bell is a British engineer with experience in the design, manufacture and operation of urban public transport vehicles, and of trolley vehicles.